A good cup of coffee is one of life's small pleasures that many people can feel passionate about. It's ubiquitous and, to a large extent, an essential part of daily life. One can have coffee in a multitude of ways: black, with cream, with milk, or with foam. There are even choices of sweetener, from none, to syrup, stevia, aspartame, white sugar, brown sugar, or turbinado sugar. Just as important but often out of mind is the roasting level of the coffee beans. If one even has a choice it's usually between regular or dark. I recently got to try a Seattle's Best Coffee curiosity pack. Seattle's Best offers its premium coffee grinds in different degrees of roasting, from Level 1 to Level 5. 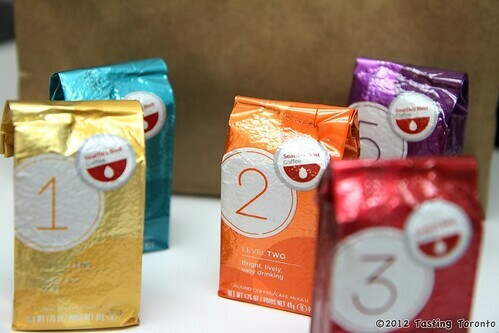 The numbering system and vivid coloured packaging makes it easier to pick a coffee for one's particular taste profile. Level 1 for example is described as mild, light, and crisp, while Level 5 is bold, dark, and intense. I personally found Level 3 to be my favourite. It had a velvety, round mouth feel, with a good balance of acidity and bitterness that one would normally associate with high-end hotel or restaurant coffee. All the Levels had a big caffeine kick which I found weirdly deceptive in the light Level 1. Level 5 loses the subtle flavours and comes closer to what would normally be called Columbian (or Starbucks, which incidentally owns Seattle's Best), with that heavy, burly punch that people associate with strong coffee. Seattle's Best Coffee is available at Mac's convenience stores. The popular Level 3 is also available in whole bean... and decaf, which might be a good idea right about now, given how wired I am now!